A year ago, if you needed to find Xia (Lydia) Li, you’d be sure to catch her camped out in a food truck on USC’s campus most weekday mornings — serving up hot pork buns, congee, and savory Chinese crepes to hungry students before dashing off to an early class. Today, Li has put her classic Chinese breakfast business on the back burner and is pursuing her Masters in Operations Research and Information Engineering (ORIE) at Cornell Tech. And while her trajectory may seem surprising to some, for Li, it makes perfect directional sense. Li grew up in Suzhou, just outside of Shanghai, before moving to California to pursue a bachelor’s degree in computational and applied mathematics at USC. But for Li, her classwork felt too theoretical. “I wanted to study something that is close to reality and that you can use in your daily life, which is why I double majored in business at the Marshall School,” she said. The only question was what kind of business she would start — a tricky question considering that Li was facing a very major constriction. Since she was in America on an F-1 student visa, Li’s business could only be operational for a single year under her visa’s Optional Practical Training (OPT). After doing some research around the USC community, Li realized that there was a desire among students for traditional Chinese breakfasts. So she decided to open her own food truck called MorningWay. Not only would it be easy to dissolve, she’d also get a whole range of experiences from marketing to manufacturing to dealing with campus and state authorities to even cooking some of the food herself. The business was exhausting, but successful. After checking her dream of being a business owner off her list, Li was ready for the the next step in her educational and professional journey: Being a part of Cornell Tech’s first ORIE class. 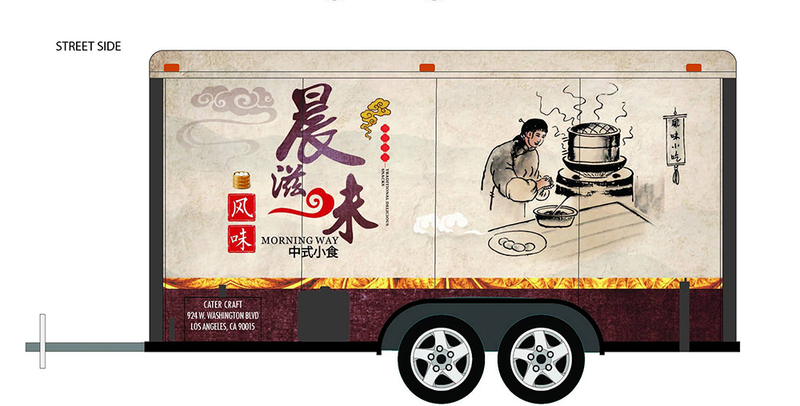 The design of Li’s food truck, Morning Way. Data science had become a professional hot topic, and Li wanted to explore the field. But while a lot of universities offered programs that included data science, they seemed too traditional. After searching through various graduate school course catalogues, Li was immediately drawn to Cornell Tech’s new program in operations research. Not only was it located in New York City — which Li admits was a big perk — but Cornell Tech also offered core technical classes (like optimization modeling and applied learning) alongside practical classes that put students in real-world scenarios. Li’s favorite experience so far was Product Studio, a course in which all Cornell Tech students have the ability to work in diverse teams to respond to questions posed by real businesses, ranging from nonprofits to large companies like Google or Amazon. Li’s team — made up of computer science students, an MBA, as well as a student from the Parsons School of Design — responded to a question posed by AOL, asking them how they might deliver news into smart home environments in a seamless and entertaining way. They decided to create a small device that projected images from phones and other smart devices onto any household surface. Not only did their product go on to compete in and win a NYC Media Lab Verizon Challenge award of $15,000, but it also fostered friendship and inspired the students to learn a wider range of skills. For example, Li said that the MBA group members’ ability to bring the team together through organization and motivation taught her strategies about effective communication. But Li hasn’t only learned from her Product Studio teammates. The diverse array of students at Cornell Tech become friends and fellow teachers. Although Li was scared to code at first, she learned the skills quickly thanks to her classmates and now feels confident her programming skills.